Which is exactly what I did when my sleep was disturbed for the second night in a row. It was another sleepless night in our household, this time due to early morning awakening (how does 4am sound?). I don’t know what’s going on, but I need to find out why, and soon. I can’t stand any more sleepless nights, especially since I haven’t had enough sleep in the last three weeks or so. Blame my wisdom teeth and all the headaches they gave me- and good riddance to them! This morning, Alphonse and I spent time watching videos of Disney and Pixar shorts. We had to wait till the sun came out to call on the nannies for help. Then it was their turn and I tried to get some energy back by eating breakfast. In the middle of my bowl of oatmeal, however, I fell fast asleep. I didn’t even notice it. When I woke up an hour later, my coffee had grown cold and my oatmeal was thick white sludge. Alphonse is still up and running, even as I write this, and I still feel like a zombie. Another pick-me-up is needed, but what? I got just the one! 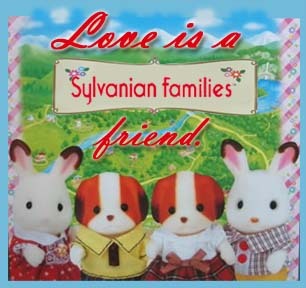 It’s a Sylvanian blog which I discovered in Facebook. It’s in Chinese, but for those of us who are clueless, there’s always Google Translate to add to the fun. Google Translate calls it “The Forest Family Lulu Cabin in the Forest” which, judging by how awkward it sounds, tells me right away that the translation isn’t quite spot on. Still, I invite you to visit the blog as the pictures are absolutely beautiful. I like best the series of renovation posts. It is mindblowing how detailed and how creative the work was. Not only that, it really seemed as if the little Sylvanians were hard at work. Here are the series of links which I will try to present in an orderly fashion. You can do without Translate and just rely on the pictures to tell you the story. I assure you, this is absolutely worth your time to see. This series is one of my favorites ever. When sleeplessness strikes again, I’ll be sure to pull them out from their bookmarks and look them over again. It’s a guaranteed perk-me-upper! While we’re on the topic of Sylvanian Families, I’d like to introduce you to a new blog friend and her wonderful blog- Caryl of Little Creations. I’ve known Caryl only a short while but as it always happens in Sylvanian world, acquaintances become new friends quite fast. Bound by a common interest that few people share, it’s easy to feel comfortable talking about the Brambles and the Macavities as if they were live relations of ours. And because we both love the same thing, there are no judgments passed, something you are very likely to receive from people who consider your interest childish and petty. Caryl, however, has one up over me. Like my friends Pei of Plastic Candy and Joanna of My Sylvanian Collections, Caryl has the miniature thumb. Not only a miniature thumb but a sewing and crafty miniature thumb! 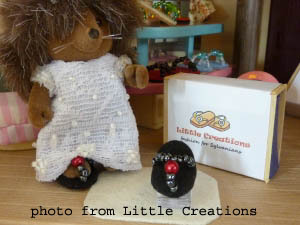 Aside from making her own display, she makes fashionable lilliputian footwear for Sylvanians! These lovely beaded collections are a sight to see. Please give Little Creations some love! 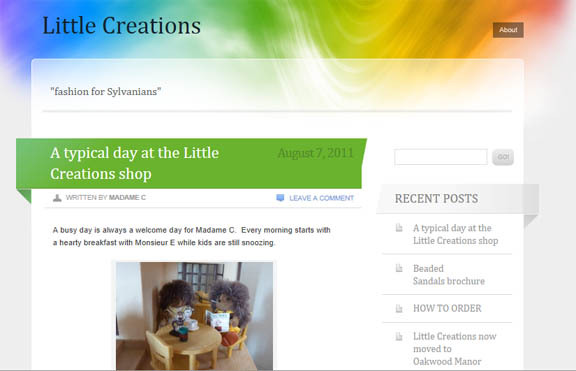 Drop by Caryl’s blog, say hello, and encourage Caryl’s little friends, Madame C and her sewing companions, in their business enterprise! 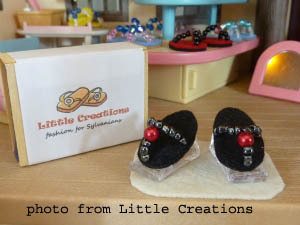 And if you’ve got some money to spare, why don’t you try out a lovely pair of Little Creations shoes for your beloved Sylvanian gal. She’ll love it for sure! I was thinking of getting a new hairstyle and color this month. I’m turning another year older at the end of the month and wanted to celebrate the coming year with a fresh, new look. While I could not decide what style and color would best fit my activities and preferences, I decided to go for a makeover of an extension of my self with a new theme for my blog. It’s pink, polka-dotted, and absolutely fabulous. It’s bold and sleek. It’s chic! What’s not to love? I don’t know how long I’ll keep this look, but for now, I really, really like it. When I started blogging a little over two years ago, I found out that one of the nicest things you could do for anyone was to give them an award, a banner, or a badge of appreciation. In those days, awards were given out so often that they became viral almost overnight. Lately, however, I’ve seen them go the way of tags and memes- rarely passed out for fear of unnecessarily bothering the recipient with spam. They’ve almost disappeared from sight, at least, in the blog circles I visit. 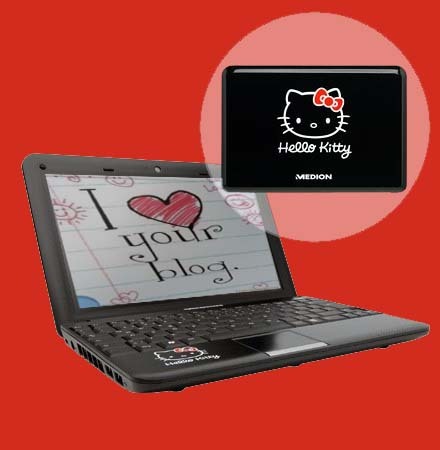 This criticism of “passing-along-something-in-blogs” and tagging nothwithstanding, with Valentine’s Day just passed, I wanted to give my very own personalized versions of the I ♥ Your Blog award to my favorite blogs and to the friends I have made and reconnected with through blogging. I am deeply grateful to these wonderful people for making the experience of blogging something to look forward to every day. 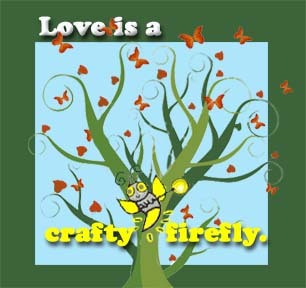 Mushings was the very first blog I ever read on the Net, long before I jumped into blogging myself. Through it, I discovered a whole world of friendships that are no less real than the ones I have in real life. 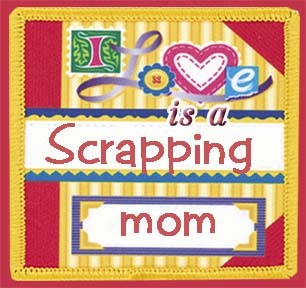 Leirs is a fabulous scrapper, aside from being a mom of two, an autism mom, and a devoted blogger. Megamom and I have known each other since high school. However, we knew little of each other except for superficial interactions and the occasional “hello’s” and “how are you’s.” I regret now that I never got to know her well then; we did not have the same circle of friends. 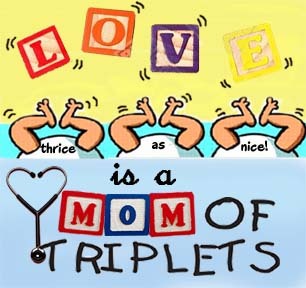 Finding her blog, after all these years, I have discovered a whole different person- an accomplished professional (a doctor), a multitasking mom of triplets, a devoted member of our high school batch, Pisay Batch 1985- in short, someone I would be proud to call a friend. 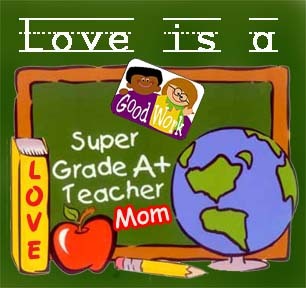 Teacher Julie was my son’s very first teacher in formal school. Alex loved her and her word was law, even in our home. I appreciate all that she has taught Alex but I will always remember most her as a friend who helped us cope in the first year of Alphonse’s diagnosis. 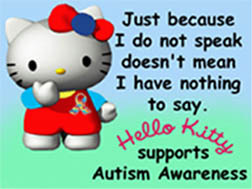 I’ve never met Ms. Susan Senator except through her book, “Making Peace with Autism,” which to date, is still the best and most realistic autism book I have ever read. 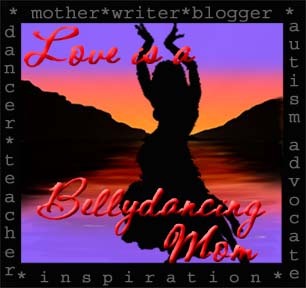 I am a faithful follower of her blog and I am at awe at how she always finds the words I am sometimes unable to express. Ms. Senator is proof that there is life, love, and laughter in autism families. No Special Effects is perhaps the only food blog I ever visit religiously. Not only is Doc Mark a genius in the kitchen, his food photographs are absolutely gorgeous. Beyond visuals, however, Doc Mark is also a gifted writer and one always finds a good story to read in his blog. Last, but certainly not the least, this is for J of My Sylvanian Collections. J and I have only been friends a short while but I always look forward to reading her Sylvanian adventures. Thank you being a great friend and a wonderful sister, shobe. And to all those who come and visit this blog, my thanks to all of you who share a part of their day with me. 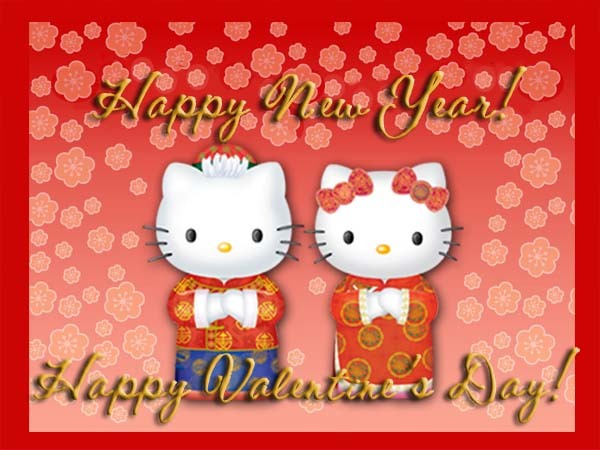 I send you love and blessings on this special month. Spread love, friends, and be blessed always! It’s getting easier and easier to pass by the computer without being seized by the urge to sit down in front of it and surf the net or blog. What started out as a Lenten exercise of self-restraint and sacrifice has become a real reflection of my constant lack of time here at home. Between my son Alphonse (with his escalating needs) and the housework, the only time I can find some respite is when he lies down at night to sleep. But I’m not giving up yet. It isn’t over till the fat lady sings. 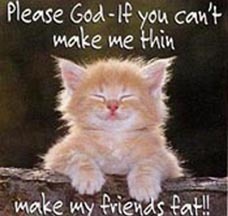 In this case, I am the fat lady, and I am definitely not singing “Adieu” just yet. This has been one tough summer, and I don’t think it’s over yet. Contrary to common expectation, summers in our household are usually periods of stress and sieges. 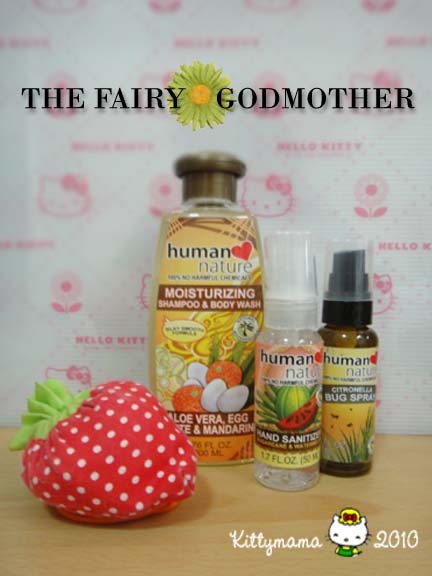 Summers are when nannies leave, either permanently or for brief vacations. Summers are when I have an extra child in the house, which necessarily translates to time divided and an increase in demand for food. 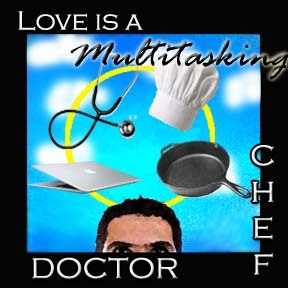 (Most days, I feel like a short order cook.) While Big Brother Alex can be a lot of help, particularly with babysitting, somehow, his presence in the home makes Alphonse refuse to work or study. I think Alphonse has learned to associate his brother’s presence with weekends and free time. As a result, he resists our schedules, and what used to be seamless transitions for his activities have become constant battles for control. Then, too, to make things just a little more complicated, with the departure of his regular nanny for a vacation, we welcomed his old nanny back into our home – with two sons in tow. While we felt that this would not be the wisest choice to make, given than Alphonse hates sudden changes, we could not ignore her pleas for help. The children were starving in their hometown, and their mother, once Alphonse’s beloved nanny of four years, begged for help, even if only temporarily. The sudden introduction of children crying loudly late into the night, of little boys poaching on Alphonse’s turf and playing with his toys, and of the rambunctious pitter patter of little feet (in early morning!) have disturbed our home’s equilibrium. The first few weeks after they arrived, I had a headache almost every day, so unused were we with having to share space with little children again. Alphonse’s sleep cycles were disturbed by the new sounds in our home, and this has made him more irritable and more prone to fits of anger. We cover our hair with bandannas all day to prevent the recurrence of hair pulling, and wear loose shirts after Alphonse ripped my good nightgowns in anger. These have been difficult days, we all know. Yet for all the difficulties we encounter, I still see goodness in these trying days. Despite the children’s wariness to their new surroundings and circumstances, they both adore Alphonse. They imitate what he does, from jumping on the trampoline, to chewing on ice (one of Alphonse’s quirks), to playing with bubbles. The older child, a five-year-old boy, declared that he will jump every day so he will grow to be as beautiful as Alphonse. The two-year-old, a very tiny squirt of a child and still more of an infant than a toddler, already acts like a big brother to Alphonse, calling out to him kindly and constantly, “Kuya Alphonse, bubbles kita?” (Big Brother Alphonse, shall I blow bubbles for you?”) In the last week, Alphonse has passed them by without so much as a glance as the kids shouted in unison, “Hi, Kuya Alphonse!” Today, he actually looked at them for a while before moving on. This is all temporary, I know. In a few months, we will have to reevaluate our domestic set-up and try to find other ways to help Alphonse and these children. Right now, our household budget is strained to the limit, and I feel the stress of having to be more creative and more resourceful in order to make everything work for this larger household. And so, between the added responsibilities these changes have brought upon us and the balancing acts as peacemaker and negotiator I perform for all the members of my family, I find little time to speak my mind in the pages of my own blog or in this forum. Today is a rarity, one that has allowed me time to breathe and recharge before I take up my role as mother to all again. But I yet hold hope that this tough summer will pass. I just have to remember to take it slowly, one day at a time.